Ghosts said to hang out here include former employee “Bus” Seymore, who is heard typing upstairs, and a little girl who sits in the conference room and has a “thing” for flashlights. Disembodied footsteps have been heard here as well. A spooky annual Halloween ghost walk concludes here. I have been inside town hall on many occasions. While in the basement I had a very heavy, solid wood door slam shut behind me. While inside chambers I heard the sound of a chair moving. I turned around to look and seen a chair had been pulled out against the wall. I went over, pushed the chair back in, and as I was leaving the room another chair started swaying rocking back and forth, as I stood and watched it. 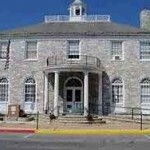 All the employees at town hall have had several paranormal experiences of there own at some point in time.